If your future includes a move to Montecito, check out Meathead Movers! Our professionally trained student-athlete movers, moving concierge, and princess packers are prepared to get you safely moved into your new Montecito home. When you make your move to Montecito, be sure to contact Meathead Movers. No matter what type of moving service you need, our student-athlete movers are ready to handle all your moving needs. 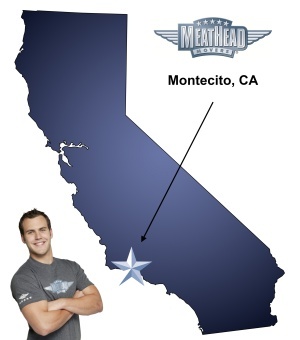 Welcome to Meathead Movers of Montecito! Montecito is one of the wealthiest and most pleasant communities in California. With public elementary schools that routinely rank among California’s elite, Montecito is a great place to raise a family. Several celebrities including Oprah Winfrey, Tom Cruise, and James Cameron, either own secondary homes in Montecito or live in Montecito for several months out of the year. The community is full of antique shops, cafes, art galleries, designer stores, retail stores, restaurants and entertainment options. If you are considering moving to Montecito, don’t choose one of the many Montecito movers that are out there without checking us out first. We’re Meathead Movers, and we do the job right every time. While other Montecito movers might hire temporary labor to help move and care for your most precious items, we don’t. We hire young clean-cut student-athletes who are trying to work their way through college. Our Meatheads go through a rigorous screening and training process to ensure that come moving day they will treat you and your things politely and respectfully. They’ll even show you our trademark Meathead hustle. When not carrying or loading your items, our Meatheads will jog to and from the truck. We will do the job quickly so that you can get settled in quickly. We are proud to offer several moving services, including commercial moves, local moves, and long-distance moves. We also offer a packing service, a storage service and our signature moving concierge service. Moving can be incredibly stressful, so we do everything we can to make sure that you are happy. We can put you in touch with quality housecleaners, junk haulers, carpet cleaners, landscapers and maintenance workers who can make your move easier. Meathead Movers is also proud to be part of your local community. We raise money through charities like the United Way, among others, and we also help out women in women’s shelters who are trying to flee abusive relationships by moving them for free. How many other Montecito movers can say that? Ultimately, that’s the Meathead Difference. We are devoted to community, quality and being the best. If you’re moving to Montecito, be sure to give us a call to learn more about our services and what we can do for you. We’ll also give you a free, no-obligation moving quote. We’re confident that, once you check out what other Montecito movers have to offer, we’ll earn your business. Moving to Montecito? Here are some helpful resources. The movers were great - as a team they worked together wetland were pleasant to be around, while they ran with boxes on dolleys and chairs and whatever. They were careful and thoughtful and eased a stressful job. Performed the impossible flawlessly. Great, professional young men as well!! Professional and very careful with house snd contents. Friendly! The team worked great together and all were extremely competent. The team seemed to take a lot of breaks. They were very disorganized when they arrived telling me they had no idea why the job was “that they were only sent from the wherehouse”. Then my bill reflected the same amount as quoted at end of assignment. I was so aggravated I signed and wanted them gone. Professional, courteous timely and experienced well-trainedstaff!! PROFESSIONAL, COURTEOUS, KNOWLEDGEABLE, PROMPT BEST PROFESSIONAL MOVING TEAM EVER!! !